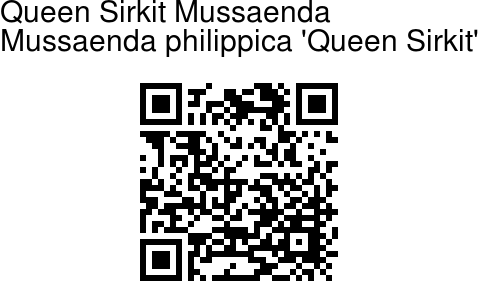 Queen Sirkit Mussaenda is a cultivar of Mussaenda philippica developed by backcrossing the F1 hybrid between M. 'Aurorae' and M. erythrophylla to M. 'Aurorae'. It was named after the Queen of Thailand to commemorate her first visit to the Philipines in the 1970's. It is among the most spectacular of mussaendas, with all five sepals enlarged up to 3.5 inches, in shades of ivory to pale pink. These large flower clusters (panicles) are somewhat fragile. During heavy rain they can become heavy, causing smaller branches to break. They also are prone to break off the plant during high winds. Queen Sirikit is a shrub about 7 m tall with dense hairs on the stems. Leaves are about 15 x 8 cm, oval shaped with a pointed end and sometimes hairy underside. 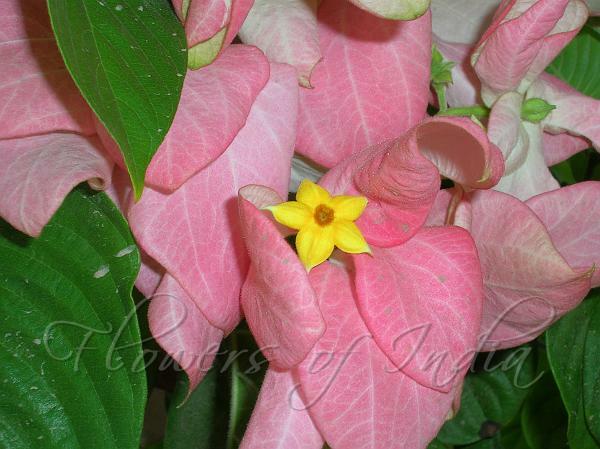 In the Mussaenda, as in Bougainvillea, the bracts (modified leaves) are actually more colorful and showy than the flowers.